I liked this book far more than the cover and title made me think I would. (The title comes from an old Percy Shelley poem, which is not my forte, and the cover is downright creepy.) I grabbed it simply because it took Newbery honors last year, and when it comes to the Newbery award, I have more hits than misses. This one was a definite hit. 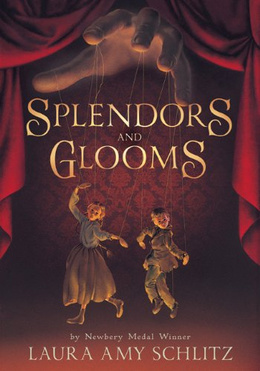 Grab Splendors and Glooms on Amazon. I tried to read this once but got distracted. Maybe I’ll have to try it again. I agree with you, Michelle, as far as trying to succinctly describe this book. There is SO much going on, but it all works out so very well. And I think the title is absolutely spot on for this hair-raising tale. I totally enjoyed every macabre moment on it. The only think that appealed to me about the book were your comments at the end. The Goodreads blurb didn’t do much for me. I don’t like creepy. The book sounds like it has a lot going on in it. Hope you enjoyed your camping trip! Yeah, that blurb just doesn’t do it justice. We were at family camp–our favorite week of the summer!